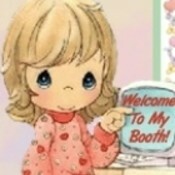 Hi, welcome to my booth. I love treasure hunting for vintage stuff. Some of the things I collect are books, vintage tablecloths, vintage Christmas & Halloween. I am a buyer as well as a seller so I do my best to describe my items including any flaws I may see. I hope to make your buying experience a pleasant one, so if you have any questions please feel free to B-mail me. Please note that items in my booth are not from pet or smoke free homes. I ship your item(s) to you within 2 days of payment received or when your payment has cleared. Shipping is based on the weight of each item. I can ship Priority Mail if you want your purchases shipped faster, otherwise I use either media mail or First Class. Thank you for stopping by and shopping with me. Once again, please feel free to ask questions. I am not always in my booth since I love to shop at members booths as well, but I am in and out of Calico Kym's to see if anyone needs my help. CalicoKym doesn't have any items in their booth! Kym collects the kind of vintage and antiques that stir up warm memories of softer times and down-home days …presented for your enjoyment with thoughtfulness and caring.